By the time we met this customer she had already done a terrific job of creating a beautiful kitchen. The gorgeous shade of grey on the walls, a sleek, stainless steel chandelier, and she had discovered this bold hexagon print by Lee Jofa, CHARIS SILVER/SHALE. Not sure how to use this fabric she loved, she said something was missing; the windows needed dressing up to bring this room together. 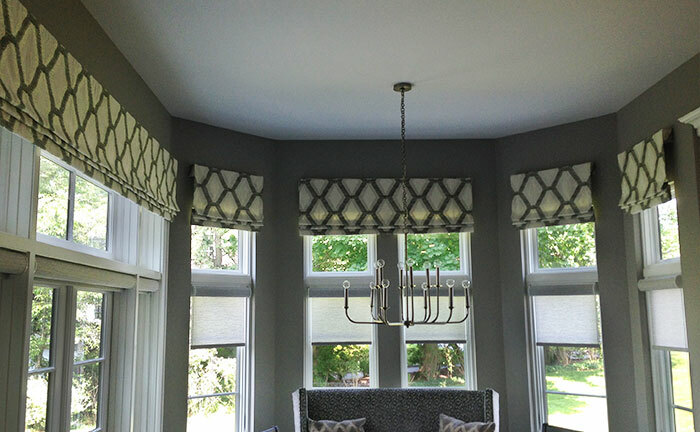 Roman shade valances allow us to present this fabulous, geometric pattern uninterrupted, rather than losing it in folds or pleats of other window treatment styles. Roman shade valances are an excellent choice when there are many windows and not a lot of wall space between them. Roman shades can be installed much higher than the window, disguising where the actual window starts. 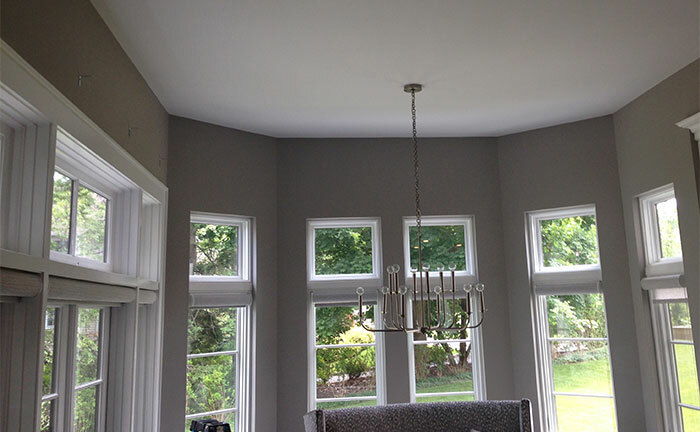 By installing the window treatment in line with the cabinet molding, well above the window, it adds both height and drama but most importantly, it maintains the brilliant natural light streaming through the octagon windows. The windows in the kitchen look fantastic, Billy took a picture! Thank you! Take a look at the before and after and let us know if you agree that the new window treatments look fantastic too! Click here for more window treatment ideas!